THE HOUSE IS NOW OPEN! I entered Cardiff’s pub theatre, The Other Room, for the first time finding myself being immediately transported back to the 90’s. Being a 90’s child myself I’ve seen the photos and heard the stories of ‘the good old days’ from my parents of what it was like to go out on a Saturday in Cardiff, writer Kevin Jones embodies those stories for me with a tale of his own, bringing the world of his childhood and teenage years to life. The set design was stunning; credit to April Dalton and Lauren Dix for creating a visual masterpiece and adding so much character to the production. I’d find myself sitting there in awe forgetting its 2018 and taking in every delicately placed photo of Cardiff past that filled the walls. There were even times I thought maybe I should have a cigarette in my left hand and an alcopop in the other; you could almost taste the Hooch. Special mention to the carpet, that in itself is worth going to see. 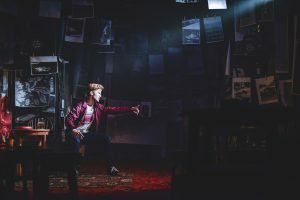 The narrative is pushed along with a mixture of ‘Bangin 90’s Tunes’, Light Designer Ryan Stafford’s excellent use of lighting and Jack Hammett’s ability to tell an immersive story. Within the first 30 seconds Hammett loads a tape into a boombox (yes you read that right), you’re straight in, and everything outside of that room doesn’t even cross your mind for the next 55 minutes. You’re taken on an emotional journey as narrator, Hammett, tells the story of a young Cardiff boy navigating his way through his teens, trying to find his place amongst friends and deciding what the next move in life is. Director Matthew Homquist speaks of music as ‘something we can all connect with’ and it’s true. As previously stated, I never experience the 90’s pubs at their height but did not feel out of place reminiscing as we all have our own experiences connected with music. We all have our own happy memories and likewise sad memories, I came away from Cardiff Boy thinking of my own experiences with friends and how some of us have grown apart after going to university and those new friends I’ve met along the way and how even now listening to songs come on the radio from 10-15 years ago remind me of key events in my life that helped shape who I am today. 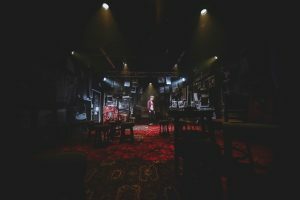 I’ve seen a couple of other reviews on Cardiff Boy which point towards ‘majority’ of the script referencing specific places/venues in Cardiff that will go over your head if you’re not from the area, however, don’t let this cloud your judgement on whether or not to go see the production. I wouldn’t like to give too much of the story away but know that Hammett’s performance, Holmquists direction and Jones’ writing is something that I believe speaks to everyone individually about their own personal experiences and you’ll naturally find yourself relating to the story. 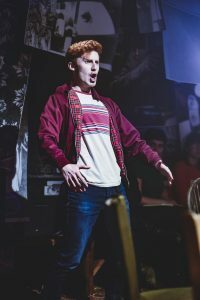 Credit to the creative’s who worked tirelessly on the production to bring it to life as it originally started as a short extracts that was selected for Chippy Lane’s Chippy ‘n’ Scratch Night 2017. Thank you to The Other Room for offering Wicid the opportunity to review the production. You can find the link to purchase tickets below and their social media accounts. Make sure to give them a like and a follow! Tickets for Cardiff Boy can be purchased here. 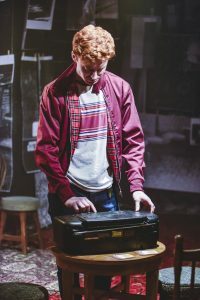 Cardiff Boy is running until Sunday, November 11th at The Other Room.